Today was one of the best days I’ve had in a long time! I chalk it up to being mentally prepared, having a great time, and of course sweat. I live for the good sweat! I also had a great lunch to prepare me for a long seminar of discussions on post-1914 American literature. My lunch was packed full of healthy fats, which keep me full in a way carbs and veggies/fruits do NOT. 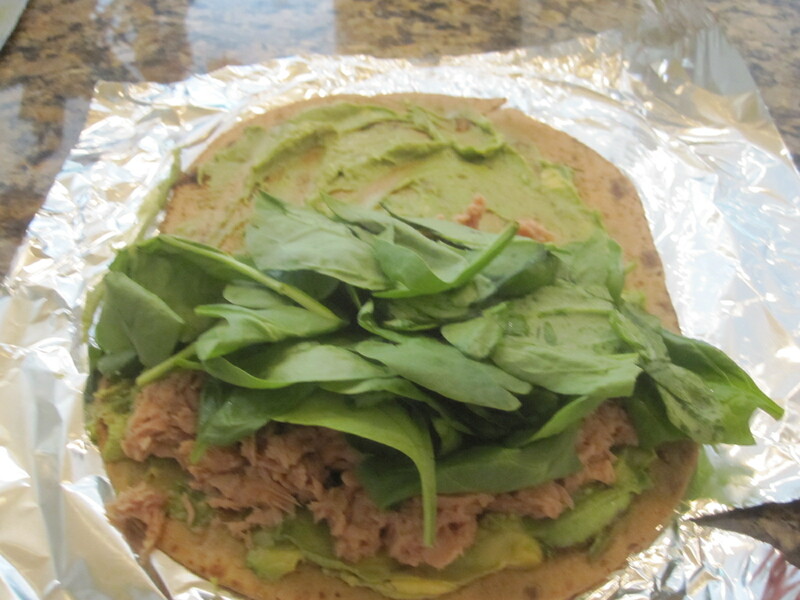 Flatout wrap with 1/4 a big avocado, 1 pack of tuna (2 servings in a pack…I eat a lot) and a big ol’ handful of spinach. I’m shocked this thing was able to close! 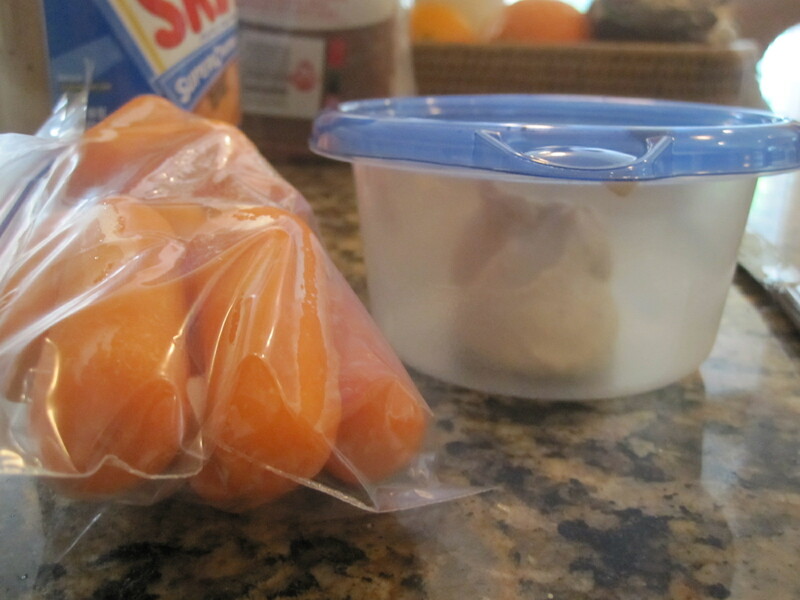 Morning snack of carrots and 2 tbsps hummus. I love love LOVE hummus. I usually only buy Sabra. Theirs is the creamiest and best. 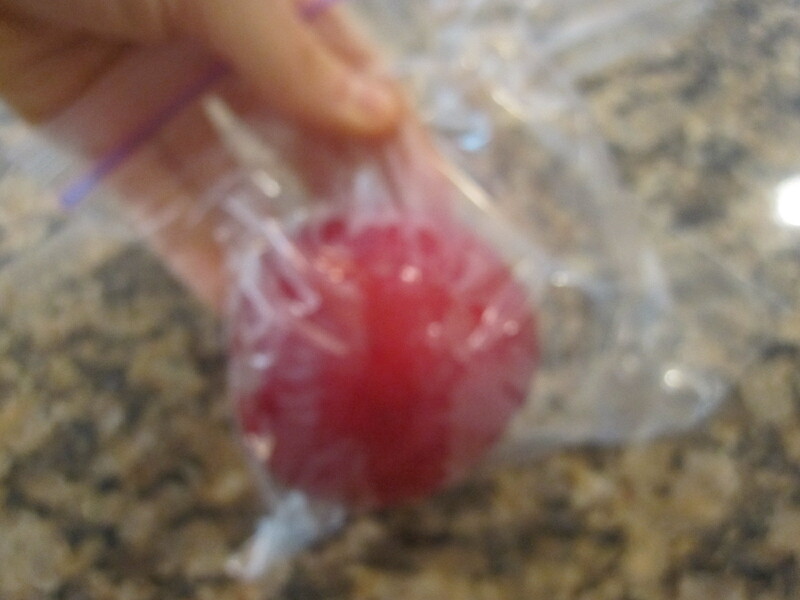 I saved my plum for halfway through our class when we took a short stretching break, and apparently my camera decided the plum itself wasn’t mysterious enough so it chose to blur out. Class was fascinating but so long! I got home around 4 and started trying to figure out dinner to bring to yoga. But first, once I made said dinner, I drove to the studio and began my prep/cleaning. 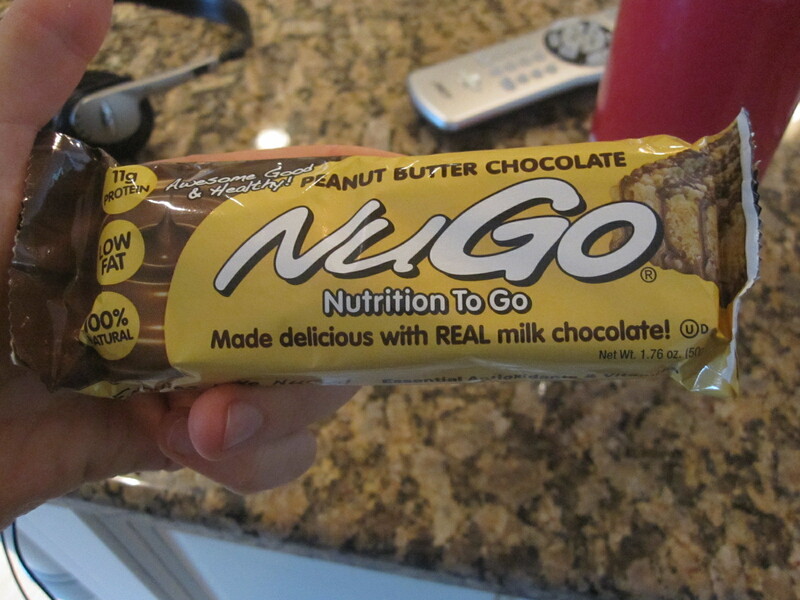 I was also planning on attending a Power Chill class, so I ate this NuGo Peanut Butter Chocolate bar for fuel. Now, let’s be honest. This was a candy bar. At least, that’s what I’m convinced it is. Because it was delicious, and full of peanut butter flavor, and only 170 calories. I think this is my go-to for any of my PB and chocolate emergencies in the late afternoon when I’m craving something tasty and peanut buttery! Holy smokes. Now I just gotta try the Larabar and see how they match up! Yoga. Was. INSANE. The Power Chill teacher, Alysse, does crazy boot-camp like moves that really have you working up at sweat. At one point we were doing Goddess pose, then falling forward onto our hands and pushing ourselves back up into Goddess, like dead drops. It was ridiculous. And I felt amazing afterwards! I’m just bummed I had to leave early since I had to welcome the clients for the later round of classes! Now, onto dinner. I had had a vision in my head of a chicken and roasted tomato sandwich. I drove home from class dreaming about it, and decided to put Brussels sprouts on the side with perhaps even a sweet potato…and then I got home and my mom told me she had eaten the last chicken breast. Dinner!fail. Not to be outdone, however, I decided to be resourceful. I also wanted to pay homage to the unofficial last day of summer we had today. I know, autumn doesn’t really start until September 22nd, but I always think it should start September 1st. And while I absolutely love autumn, I wish summer could hold on just a little bit longer…which it apparently is, considering it is sweltering outside! Anyway. I started by sauteeing about 1/3 a block of tofu in a skillet until golden brown. Then I tossed them on top of spinach, strawberries, blueberries, one giant sliced beet, and a tbsp cocoa-roasted sunflower seeds. 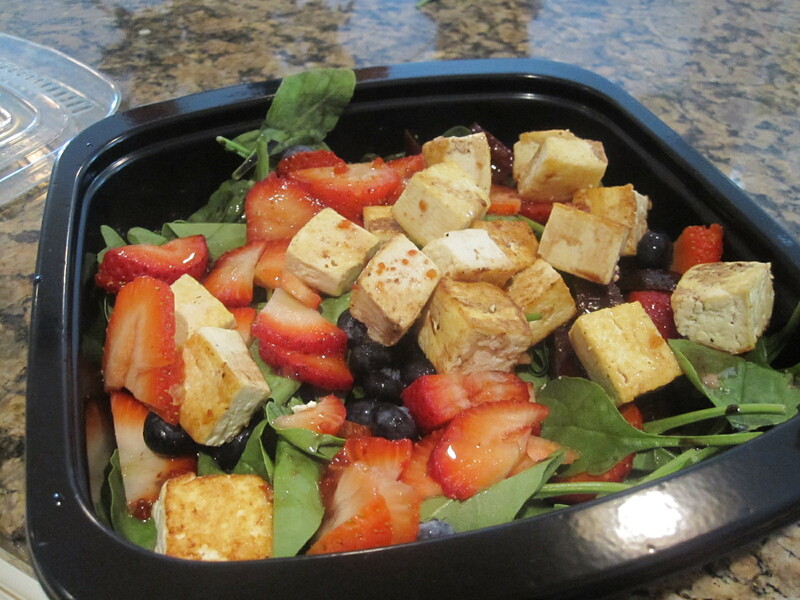 I drizzled strawberry balsamic and regular balsamic vinegar on top. 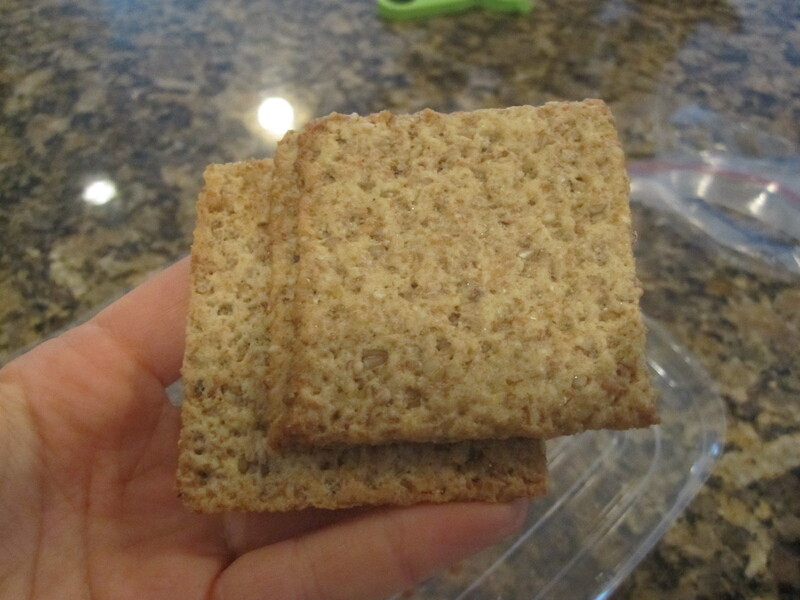 And served it all up with a serving of Kashi Crackers. I wish I had found something to dip these in, I didn’t like eating them all by their lonesome! This was cool, sweet, and refreshing. And very filling, thankfully! I came home from yoga craving something sweet, but my yen for mint ice cream from earlier had subsided. 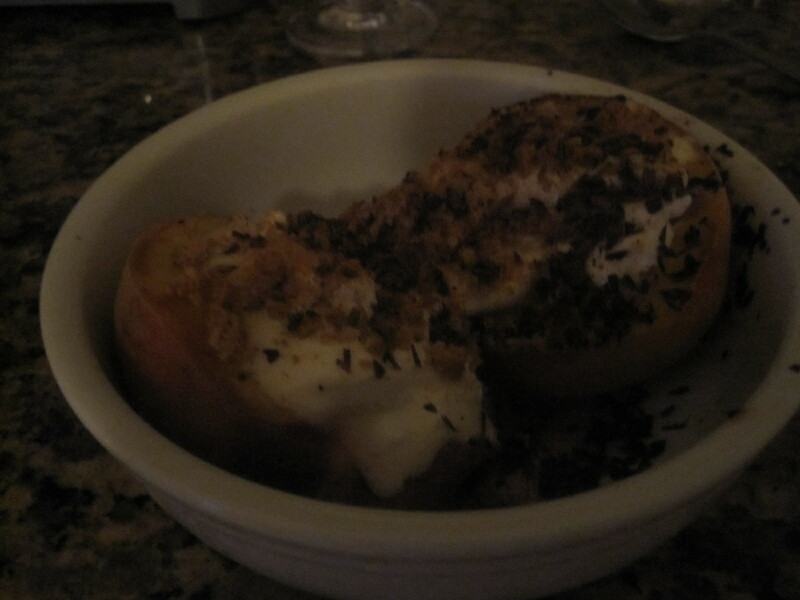 I ended up taking a page from Cooking Light magazine and trying out their Chocolate-Amaretti Peaches recipes, but short-cutting the bejesus out of it. I’m pretty sure this came very close to the real thing, although mine was obviously better because of the added Reddi-Whip and the fact that I used both sides of the peach when the recipe tells you to use one. Because I’m a glutton. Today I was full of energy the entire day. I need to incorporate more fat into my diet all the time. I absolutely loved how vital and happy I was this entire afternoon. It felt fantastic. Now, if I could just digest starches again, I would be one happy chick. Should I dare attempt bagels with peanut butter tomorrow? Or stick with oatmeal? Ah, but part of me craves (CRAVES) that yogurt pudding again. I’m going to sleep before I think about this too much!